Ten inch quilt blocks are a favourite of quilters. However if you are wanting to make a smaller version of any given 10" block, with a little finagling, the math for a 7½ inch block is not that difficult. And -- for the blocks below, I have done that math for you! A win-win! 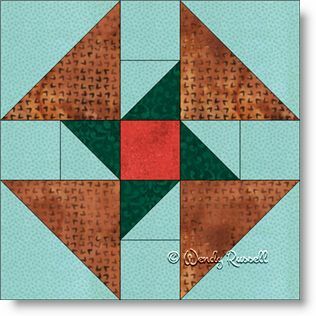 The By the Sea quilt block is a good choice for a beginner quilter as it uses only the two most common patches -- the square and the half square triangle. This five patch block is constructed as an uneven nine patch because I feel that is an easier method for construction. The colour choices here are (in my mind), reflective of the sand, surf and sunset on a beach by the sea. The sample quilts illustrated both show the blocks set on point. The left quilt features many whole blocks as well as partial blocks, separated by sashing strips. The quilt shown on the right adds additional colour by using blank blocks to showcase your quilting skills.